LightArrow Organizer is perfect for juggling the family calendar, keeping up with professional obligations and practicing GTD®. Organized and productive individuals need information for their work and life in a single glance. This is precisely what the LightArrow Dashboard does. Enjoy easy-to-read, accurate information at your fingertips, anytime and anywhere. Enjoy eight complete calendar and agenda views for better visibility into your daily agenda, monthly calendar, weekly calendar and yearly calendar. 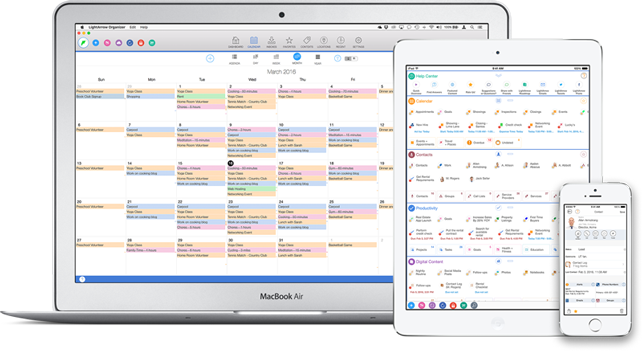 LightArrow Organizer works with the free shared calendars that your iOS device supports allowing you to use shared family calendars and professional calendars to which you subscribe – all in one place. Complete project management keeps your work and life on task. Track your projects and their delivery. Attach supporting information to projects, such as reminders, appointments, files, photos, expenses and more. Add participants and instantly communicate with this group of users. Efficiently manage personal and professional contacts, as well as local businesses and service providers that you do business with. Optional custom log forms and items for contacts allow you to add user-defined information about your contacts and divide them among iPad or iPhone contact groups. CSV import and export are also available for your contacts. Managing email is important for anyone’s productivity – especially busy families and professionals. Filter email from senders across email accounts, and narrow email search criteria by using specific keywords found in email messages. Be more efficient and get to “Inbox Zero” by converting email messages to actionable calendar items. LightArrow Organizer makes creating and sharing to do lists and other lists, such as grocery lists and checklists, easy. In a few simple taps, share lists via email, and family members or professional colleagues can open these lists in their own copy of LightArrow Organizer. LightArrow Organizer catalogs the assets individuals lease or own, coordinates the trips they take, and helps them monitor their money through payments and expenses. Get a handle on deposits and total income by managing lists of transactions and tracking expenses. Many individuals, families and professionals use several websites and need to recall a number of usernames and passwords. Use the secure password and private information manager with strong, military-grade 256-bit AES encryption to store and locate passwords, secret codes, private photos and other information with ease. Individuals often collect digital content from different sources. Keeping this information organized is key to staying productive and informed. Bookmark things you find, make checklists and to do lists, take notes, securely store passwords, and access online documents and notes from your favorite cloud services such as Evernote® and ToodleDo®. LightArrow Organizer’s Inboxes combines information feeds from email, social media and the web and also lets individuals convert this information to activities, such as tasks – saving precious time.